We really enjoy tasty smoked haddock on a fast day, but were getting just a tad bored with the same old simple wilted spinach, smoked haddock and poached egg that we have had so often. So I looked online for some inspiration and found an interesting recipe on BBC Good Food, from which I developed this fast day friendly version. Using cauliflower on top of the spinach and fish turns this into a complete meal. Choosing a strongly flavoured cheese like parmesan means that you can use a lot less but get a fantastic flavour. 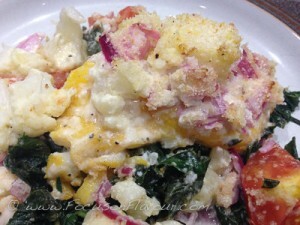 This got the thumbs up from us both and I will definitely be making it again! For a vegetarian version, you could use smoked tofu, which would have a similar balance of flavours. But I also think that it would be lovely with a couple of big mushrooms each and maybe some chopped walnuts in the topping and some extra cheese. 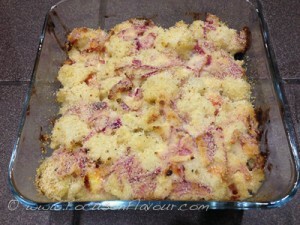 A fast day friendly fish gratin! Totally delicious and satisfying, a one-dish meal. the cauliflower makes an excellent alternative to potatoes. Lightly grease a shallow oven proof dish. Put the cauliflower florets in a saucepan of boiling water to cover and simmer until just tender. Put the spinach in a colander and gently pour over hot water from a kettle to wilt it. Freshen under cold water and then squeeze out as much water as possible. Roughly chop the spinach and spread over the bottom of the oven dish. Lay the haddock fillets over the top and tuck the tomato pieces around them. Drain the cauliflower florets and distribute evenly over the top. Season well with black pepper. Mix together the cream, lemon juice, parmesan and onion with some freshly grated nutmeg. Spread over the top of the cauliflower. Bake in the oven for about 30 minutes until the topping starts to turn golden. 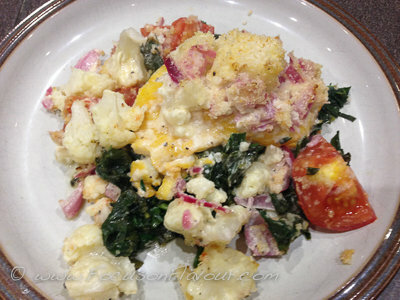 This entry was posted in Fish, Recipe and tagged 5:2, cauliflower, fast day, fish, gratin, low calorie, recipe, red onion, smoked haddock, spinach, tomatoes by Belinda Berry. Bookmark the permalink. I haven’t actually tried freezing it, but I can’t see why it wouldn’t work just fine. Thanks Belinda. I will try it.